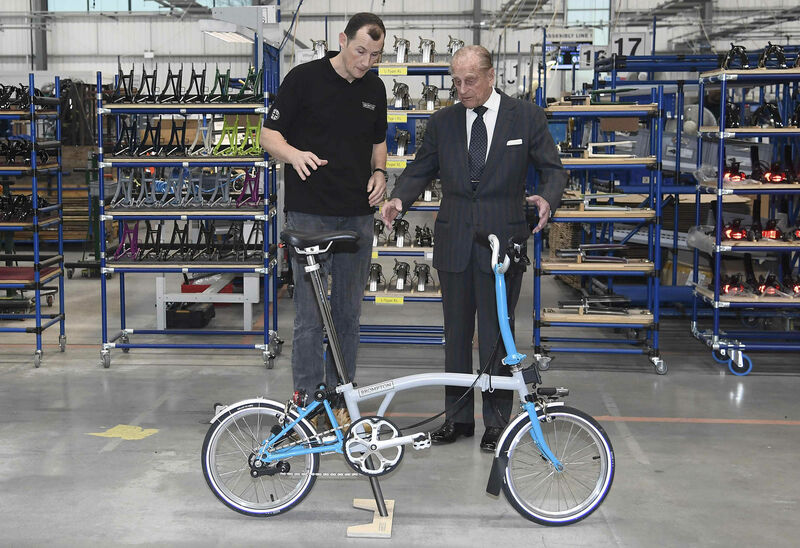 The Duke of Edinburgh has officially opened a new Brompton Bicycle Factory in London. His Royal Highness visited the factory in Greenford and met a range of skilled engineers who make and manufacture the folded bikes on 28 November 2016. The Duke also met inventor Andrew Ritchie whose company has won a number of awards including The Prince Philip Designers Prize in 2009 and The Queen’s award for Enterprise: International Trade (2015). "We're thrilled," Mr Ritchie said, "He has been once before - and it's incredibly nice of him to come a second time. I'm just bowled over by that." During the Invictus Games in 2014, Prince Harry cycled on a Brompton bike between venues at Queen Elizabeth Park. The iconic Brompton folding bike can be traced back to 1975 when the Mr Ritchie created prototypes of the bike from his flat in South Kensington, overlooking the Brompton Oratory Church. Over 450,000 Brompton Bikes have hit the road since 1975, with 44,000 to be produced this year. One bike is made every 3.5 minutes on the assembly line. The Duke showed a keen interest in the manufacturing process as he was introduced to workers at all stages from the drawing board to delivery, then unveiled a plaque to mark the opening.